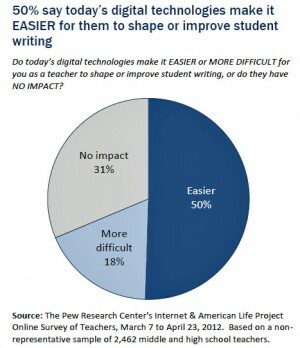 How Do Tech Tools Affect the Way Students Write? The 2,462 educators surveyed, who were either Advanced Placement teachers or National Writing Project teachers, largely agreed that technology positively impacts students with their writing, personal expression, and creativity, and facilitates collaboration. The ability to share work with a wider audience beyond the classroom is particularly engaging, with 96 percent of teachers responding that digital technologies make it more possible. “In my experience the extended audience provided by online writing encourages students to be more deliberate and thoughtful,” said one teacher surveyed. On the other hand, another noted that “the informality of the written word and how students use the language is the downside of technology, but the upside is that students are communicating in the written form much more than I ever did at their age,” said another teacher. Many teachers reported that students are more willing to offer feedback and advice to peers through a shared document. And they approach the writing process more fluidly. “I have seen students more willing to go back and revise or improve their work in order to provide more clarity when using digital tools than when they are writing it on paper,” a teacher said. At the same time, the ubiquitous presence of technology and the dominant ways students use it have had some negative impacts on writing. Teachers report that students blend formal and informal writing, often having trouble choosing a deliberate writing “voice” or “register” based on audience. And as the digital tools push for truncated communication, teachers report that in some cases students struggle to write longer, more complex pieces. But writing formally is still important to teachers; 92 percent of those surveyed replied that “formal writing” is an essential skill for students to learn; while 91 percent said “writing effectively” is essential. Shorter attention spans made it more challenging for some students to work on longer, focused writing and reading. Sixty-eight percent of teachers in the survey report that digital tools make their students more likely to take short cuts. Another 48 percent reported that the tools make students write quickly and carelessly. What's more, many teachers felt students don't have a good understanding of fair use and copyright laws, and don’t digest complicated texts well. In both categories, more than two-thirds of teachers rated their students “fair” or “poor.” Students have difficulty discerning the original source of online content and citing it properly. But teachers are responding to those challenges. 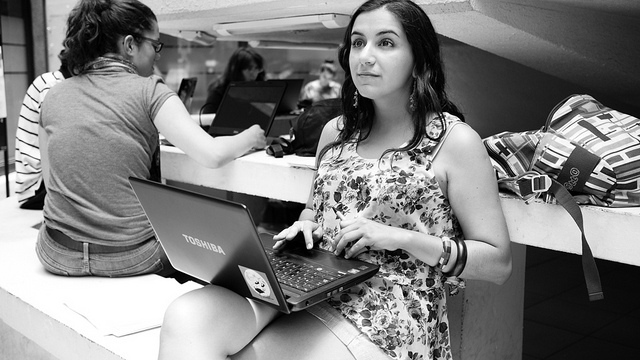 Eighty-eight percent reported that they go over how to cite Internet sources and what constitutes plagiarism. Another 77 percent say they spend class time on fair use and copyright rules. Still, it’s tricky for teachers to teach responsible citation practices when they are learning alongside their students. It’s worth noting that many of the educators surveyed for this report work with some of the country’s most advanced students, and not necessarily representative of all teachers and classrooms, especially given that many schools don’t have access to the same technology tools in the first place. However, some of the findings, like a tendency for students to blend informal and formal writing styles or to find writing and synthesizing longer texts difficult could be seen in less advanced students as well.